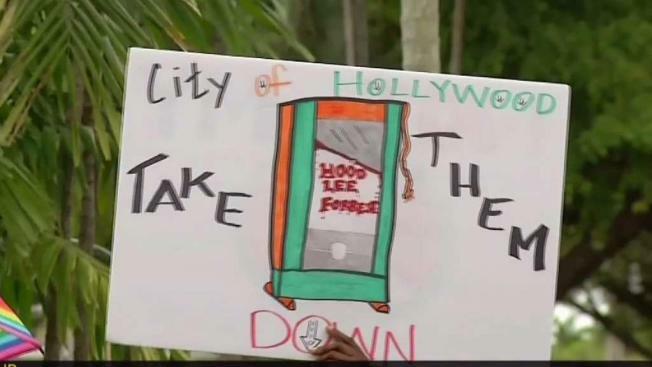 After weeks of protests, heated debates and several arrests, the city of Hollywood, Florida, has agreed to change three streets' names that honor former Confederate generals. During a Monday night meeting, city commissioners agreed on two measures to begin the process of changing the names of Lee, Hood and Forrest streets, according to the Miami Herald. The streets are located in the black neighborhoods of the city. One street honors Nathan Forrest, a Confederate lieutenant general who later on became an early leader of the Ku Klux Klan. Commissioners voted to waive a city policy conducting a poll of those who might be affected by any name changes, so officials can vote without it. The second measure called for dual names on the streets for two years, allowing residents to get adjusted to the change. The formal vote by city commissioners will take place August 30. The current plan calls for Forrest Street to become Savannah Street, Hood Street to become Macon Street and Lee will be renamed Louisville. The issue has been a lightning rod across the Southeast, with cities like Orlando and New Orleans removing statues of former Confederate leaders while others, like Hillsborough County, Florida, voting to keep theirs.